James Leslie (Les) Darcy was born on 31 October 1895 at 'Stradbroke' near Woodville. After leaving Oakhampton Public School in 1907 aged 12. Darcy worked as a carter before being apprenticed to a blacksmith at East Maitland. He began to fight in boxing tournaments, soon after, showing a natural talent and starting to attract a large following in his local area. he went on to carve out a remarkable, though short lived, career in the sport. 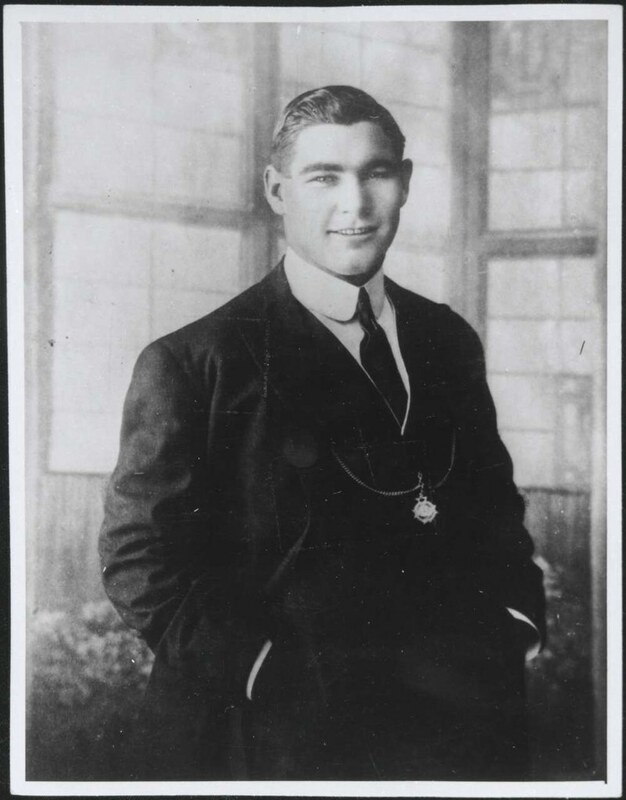 Darcy had established an impressive winning record at Newcastle and Maitland in 1912/13, and although losing to the Australian welterweight champion Bob Whitelaw in November 1913, he had captured the attention of Sydney boxing promoters, quickly becoming a crowd favourite. In a January 1915 fight with American Jeff Smith, billed as a contest for the world middleweight championship, Darcy was disqualified for refusing to continue the controversial bout, but that was reversed in a rematch a few months later where Les Darcy won by disqualification. During his short but brilliant career he defeated top flight visiting American fighters such as Eddie McGoorty, Billy Murray, Jimmy Clabby, George Chip, George Brown and Buck Crouse. In 1916, Darcy defeated Harold Hardwick to capture the Australian heavyweight title. His reach was longer than his height. Attended his funeral in 1917. At the end of 1915, Darcy announced his intention to accept an offer of fights in the United States of America but later changed his mind. Some months later the political landscape surrounding conscription for World War I saw passports being refused to Australian men of military age. As Darcy was seen as a high profile public figure, pressure was being put on him to enlist. In October 1916 he sailed to the United States of America, claiming he wanted to make his family financially secure before he considered enlisting in the military. His decision to leave Australia was disastrous for his career as political pressure in the USA saw promoters lose interest in him. Over the five months that Darcy travelled in the United States, he gave some vaudeville exhibitions and on 5 April took out US citizenship. A fortnight later after a bout he had arranged in Louisiana was also banned, he volunteered for the army. Another fight was arranged in Memphis, Tennessee and Darcy's call-up was deferred so that he could train, but on 27 April he collapsed. He was admitted to hospital with septicaemia and endocarditis, and after developing pneumonia died on 24 May 1917. An immense funeral procession took place in San Francisco before Darcy's body was brought back to Australia. A crowd of several hundred thousand was in attendance at the funeral procession held in Sydney, and following another huge crowd at a procession in Maitland, Les Darcy was finally laid to rest in the Catholic section of East Maitland cemetery. He was inducted into the International Boxing Hall of Fame in 1993 and the World Boxing Hall of Fame in October 1998.